Levels of violence crept up in Iraq over the past fortnight, but conditions have been generally quieter over the last four months when compared to earlier in the year. AKE has compiled maps showing the distribution of the latest violence. The first map shows the location of specific incidents of violence, pinpointed around the country. Attacks have been concentrated in Baghdad, Mosul and Kirkuk, as well as other urban areas running from Hadithah in Anbar province, through Ramadi, Fallujah and Abu Ghraib, on to Diyala province and south through Babil province. Other hotspots include Tuz Khurmatu in Salah ad-Din province, Kut in Wassit province, and Basrah and Nassiriyah in the south of the country. Turkish military activity has also affected the sparsely populated northern borders of Kurdistan, which creates what could be interpreted as an alarming belt of violence in what are otherwise very quiet provinces. However, the Kurdish region remains stable and the activity is having very little impact on local security, save in the immediate border area. The second map shows the approximate frequency of violence on a district level over the past four months. The two most hazardous areas in the country are Baghdad and Mosul, followed by the districts of Kirkuk (Ta’mim province), Ba’qubah (Diyala province), Abu Ghraib, Fallujah and Ramadi (Anbar province), and Mada’in, Mahawil and Hillah (Babil province). Which districts see the most - and the least - violence? In addition to Kurdistan, areas which remain consistently quiet include Muthanna and Najaf provinces. Incidents have also been very infrequent in a number of the oil-rich southern districts, including a number in the provinces of Basrah, Dhi Qar and Maysan. Security remains a concern in these areas and companies will still need to take precautions, but the outlook appears favourable for the many firms looking to do business in the region. 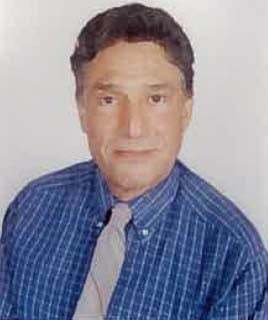 John Drake is a senior risk consultant with AKE, a British private security firm working in Iraq since 2003. 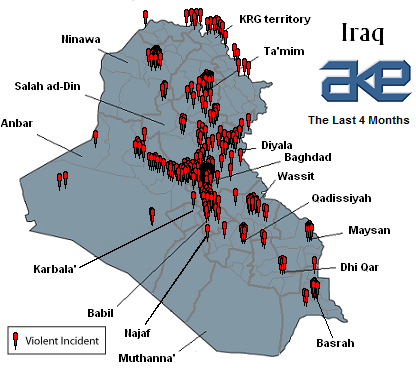 You can access AKE’s intelligence website Global Intake here, and you can obtain a free trial of AKE’s Iraq intelligence reports here.